I had a nice opportunity to work together with Maciej Michalski, young, aspiring filmmarker and director on his first full length feature, Królowa Śniegu (The Snow Queen). The main goal was to create sequences of a flock of flying crows and later compose them with the recorded film footage. Stage 1 Body and fur modeling. Stage 2 Texturing feathers and body. Stage 3 Rigging feathers and body, preparing animation control layer. Stage 4 Preparing animation cycles. Stage 5 Simulating flock behaviour with ICE module for each of the scenes. Stage 6 Rendering simulated meshes with Mental Ray, preparing additonal data for post production phase. Stage 7 Composing rendered data over the video footage. Applying motion blur, depth of field, fog and grain. All of the 3D footage was created in Softimage XSI with the intensive use of ICE framework and Mental Ray engine. The modeling and texturing phases were realized with standard modeling tools available in the software. Some of the scenes involved also fur setup for detailing the final mesh. For the feathers one master instance was modeled and then cloned and propagated along the wings with different scale, rotation and placement using linear interpolation formulas. The most important stage of the project: rigging, utilized specific tools such as constraints and model structures available in XSI. The rig consists of two layers, one of which is responsible solely for deforming the mesh. The second layer drives the underlying structure of bones through orientation operators and stores the animation data. The animation cycles were then saved as Actions. When the animation process was finished, the prepared model data was exported for extensive use in different simulation setups and lightning environments. The model was then imported into each scene and actions were fed into Animation Mixer for further modification and looping the sequence. 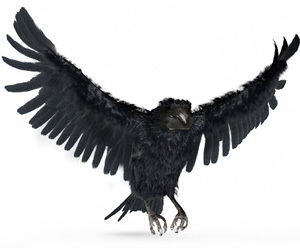 The animated model was included in ICE simulations which allowed for offseting the animation cycles in time and drive the position of each instance of the bird. The factory ICE compounds were enough in most cases to reach the desired results in simulation, however few of the scenes required specific setups which involved basic scalar and vector math. Each scene went through rough previsualization stage to ensure the animation fits its environment and creative decision requirements. As the work progressed the quality of initial rig developed further. With each new scene the latest version available was utilized. After finishing the animation stage the animation was rendered in Mental Ray engine integrated with XSI. Most of the scenes use direct illumination lightning setups along with ambient lightning and raytraced shadows. The rendering phase required optimization and debugging cycles in order to render the final footage successfuly, often utilizing channels, passes and sequential rendering for that matter. One of the most important benefits was going through all the production stages in order to provide the final footage. Thanks to specific workflow of the software involved most of the process went fine. The project turned out to be very insightful especially in case of linking final rendering process with the post-production stage. In most cases both of the stages appeared very complementary, thus blurring the boundary between each other. The very Mental Ray integration in Softimage XSI allows for vast possibilites due to mature architecture of the renderer. This specific trait has also its disadvantage which is limited performance requiring very good knowledge of the engine and its drawbacks. After successful dealing with it, one obtains very functional renderer offering many capabilities to work with. The third major benefit was in-depth learning ICE instances. Working with complex models, which is the case with birds, required dedicated workflow in order to prototype the simulations efficiently. It also required to address specific renderer issues in this field. Obtaining said experience allows to run future projects with more confidence in this area.